Brexit talks are still in progress and GBP is acting strong at the moment. Today the UK will release the manufacturing PMI data which will probably support GBP too. 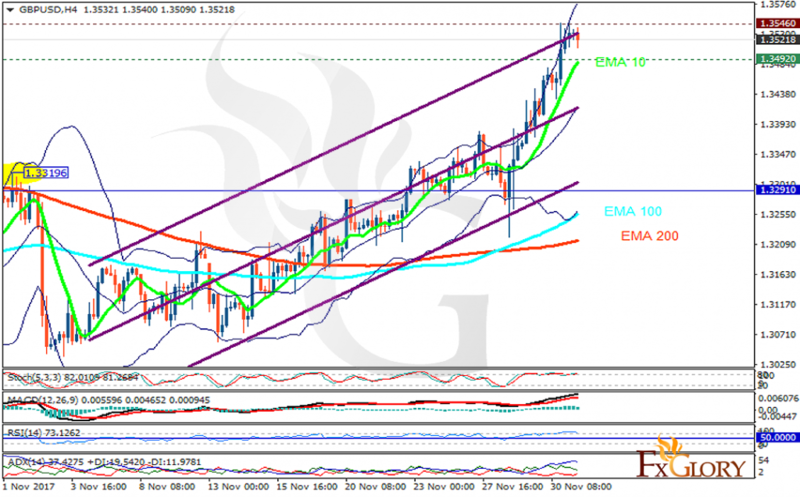 The support rests at 1.34920 with resistance at 1.35460 which both lines are above the weekly pivot point at 1.32910. The EMA of 10 is moving with bullish bias along the ascendant channel and it is above the EMA of 200 and the EMA of 100. The RSI is moving in overbought area, the Stochastic is showing upward momentum and MACD line is above the signal line in the positive territory. The ADX is showing buy signals. Long positions are recommended towards the upper Bollinger band targeting 1.365.